After being overweight for most of my adult life and starting to accept it that this is just who I am, I stumbled on a documentary about a guy that lost 100 pounds on a juice fast. This inspired me to do a juice fast and with that I started doing a daily video about it as days went by. 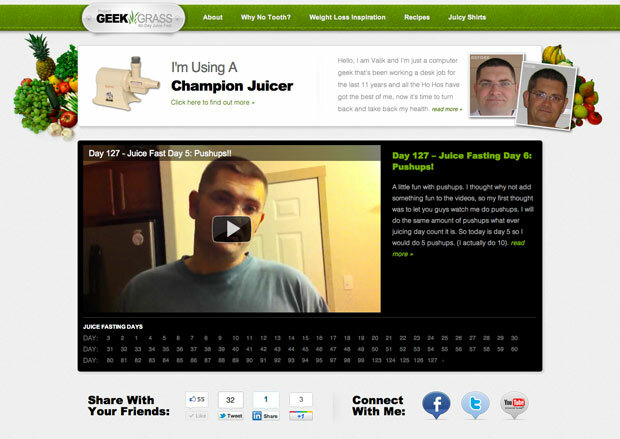 This is a highly customized WordPress theme that has a video player on the front page that shows the most resent post. Under the video I made a quick way to access the different days of my fast. It was suppose to only have 60 days but it’s gone out of hand and I am now up to day 127. Although I am not on a juice fast right now, I am still on the project and am on a raw food diet. Juice fasts are still on the horizon but I doubt I will do one that is going to be that long again.